You'll have to indulge me a bit with the title of this post. 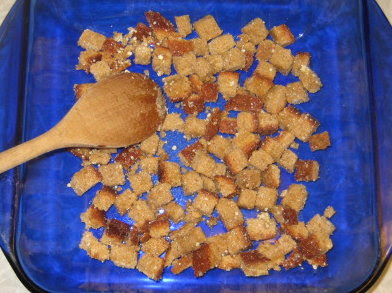 My homemade croutons are not world famous, except perhaps, in our little world. But this is what DH calls them because he thinks they are the best thing since sliced bread. Actually, they are made from sliced bread crusts, and we love them on salads and in soups. This is the perfect thing to do with leftovers and ends of homemade bread: the stuff that's too dry for a sandwich, but not hard as a rock yet. I often toss my bread crusts into a bag and pop them into the freezer until I have enough for a batch. 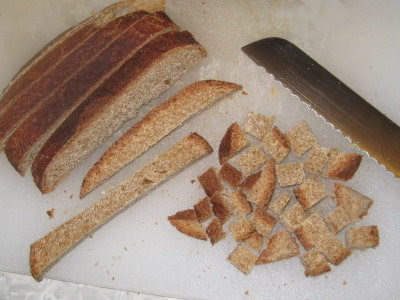 This is some of my homemade sourdough bread, being sliced into bite size pieces. We like them simple, just drizzled with olive oil and sprinkled with Parmesan cheese. 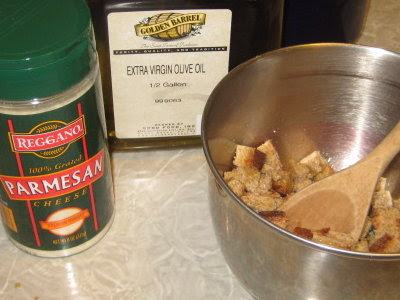 I've also used melted butter, and seasoned them with garlic powder and other dried herbs. Tasty! 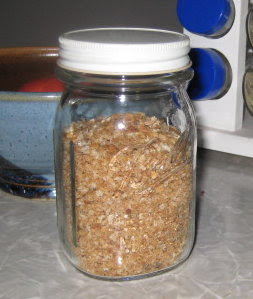 The other thing I do with leftover bread is make bread crumbs. I dry it out and whir it up in my blender. Perfect for any recipe calling for them. ha, I had to laugh about the "learning it the hard way":)) exactly what happened to me.... I usually put those into the range, but once I forgot them and only remembered when the range started smoking! they had turned into tiny pieces of black coal - and went back into the range straight away - into the fire area:)) I use them the same way, or I grate the dry bread finely to use as bread crumbs to "line" baking tins, to put into meat loaf etc. if the bread is only slightly stale I might make a bread and butter pudding instead. The horses love stale toasted bread, so...well, I always like to bring treats out to the boys. I have used stale bread for both croutons, bread crumbs and bread pudding and also in a cheese and veggie gratin of sorts, or maybe a strata, anyway, eggs are involved, cheese,milk, lots of butter and sauteed veggies on hand. Sort of a savory bread pudding. We eat them! Usually as a sandwich. Yesterday I found a gardening book for my area. It has month by month what I should be doing... I'm apparently too late for this year. LOL! I should have bought it, I'll probably go back and get it today. I never have leftover bread. When I make bread, I fashion half the dough into a loaf and make 16 rolls from the rest. The loaf gets eaten straight away, while the rolls go into the freezer. If it seems likely that we might not be around to eat the loaf before it gets stale, I use all the dough for rolls. I feed them to the chickens, if the dogs don't get them first. Unfortunately, my dogs willingly eat anything I do, including asparagas! Since they're usually in the kitchen when I'm cooking, the chickens are left without "left overs." Looks so good!!!!!!! Can't wait to try them. 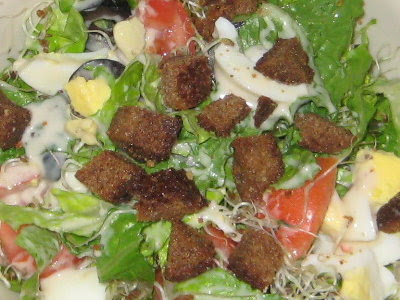 Salad look wonderful! Mmmm, bread and butter pudding. Sounds lovely! I like bread crumbs in my meat loaf too, but I admit I usually use fresh bread crumbs for that though. Theresa I used to save all my bread crumbs for my bunnies. Dried as hard as a rock. I love the idea of bread pudding. I haven't made that in a long time. My grandmother used to make strata and it was delicious as I recall. I think I have her recipe somewhere. I'm going to need all the egg recipes I can get pretty soon. Renee, I have that same book for my area! It's very, very helpful. Do what you can this year and have it as a handy resource for 2011! Mary, rolls is a good idea. I do that sometimes too, but usually bake the loaf in my bread machine. Easier! Having rolls in the freezer sure would be handy though. Laura, your dogs eat asparagus? How funny. I'm sure my chickens would love bread crumbs, but Dan really, really likes those croutons. Barb the salad was as tasty as it looks! With three men in the house I don't really have much "leftover" but on the rare occasion that I do I make bread pudin if it's enough. If it's not then the ducks at the lake get fed some. Those croutons look tasty, I like the idea of adding cheese. I treat dried out crusts of bread as biscuits, cut them thin and eat with cheese. If there's enough bread to slice it goes in the toaster and when it's hot and buttered you don't know it was dry. Four new loaves of bread are in the oven as I type, so we'll have fresh bread today! This looks really yummy, I will try it soon! Deep End I have to admit that I jealously guard some of my bread in order to have it for those croutons! Bread pudding sounds really yummy though. Something to do with all those eggs once my chickens start to lay. Dorothy, you are so right about how toasting takes care of any dryness in old bread. I like the idea of slicing thin and toasting as biscuits. That would be wonderfully tasty with salads and soups too. Charlotte, it is! A favorite around here.